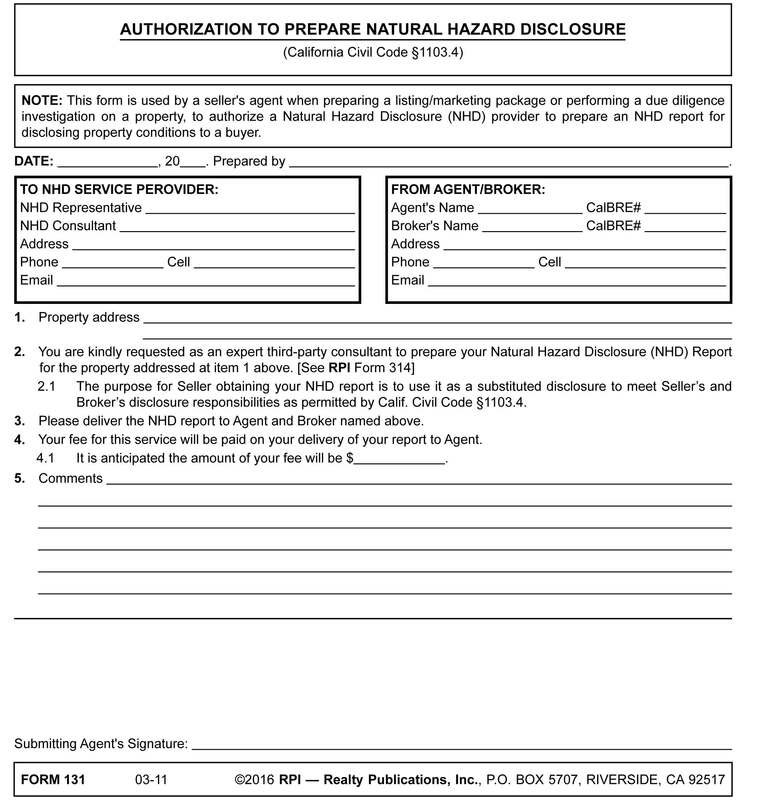 This form is used by a seller’s agent when preparing a listing/marketing package or performing a due diligence investigation on a property, to authorize a Natural Hazard Disclosure (NHD) provider to prepare an NHD report for disclosing property conditions to a buyer. The primary objective of a seller’s agent on taking a listing is to solicit and locate prospective buyers who submit an offer to acquire the listed property, as sufficiently disclosed by the seller and their agent so not to mislead the buyer about its condition. When a prospective buyer is located, directly or indirectly via a buyer’s agent, the seller’s agent owes the buyer a general duty to voluntarily and promptly provide critical information on the listed property that might adversely affect its value. This property information is collectively referred to as material facts. Upfront factual disclosures put the buyer on notice of conditions on or about the property known to the seller or the seller’s agent. Without this information, a prudent buyer is unable to set a price and make an offer. For the most efficient delivery of property information for timely presentation to prospective buyers, the seller’s agent at the listing stage gathers data on the property and organizes it into a marketing package. These reports put a face on the property so it can be fully evaluated by prospective buyers and a sale more effectively negotiated. Negotiations with a prospective buyer triggering a full disclosure commence when the prospective buyer or their agent first seeks out additional information on the listed property beyond the minimal data contained in a promotional flier. the seller to avoid any claims made by a buyer that the condition of the property is other than represented by the seller. The HIR is attached to the seller’s TDS. Both are included in the agent’s marketing package presented to prospective buyers as soon as possible — but not later than the seller’s acceptance of an offer submitted by the buyer. Further, to retain control of the transaction, the seller’s agent needs to request and initially use the HIR (on behalf of the seller) to supplement their observations during the mandatory visual inspection of the property when reviewing and approving the seller prepared TDS. The seller’s agent loses control over the marketing and sales process — and exposes themselves and their seller to claims of misrepresentation — when the buyer goes under contract without first handing the HIR to the buyer or the buyer’s agent for their review, approval and reference. The buyer’s reliance on an HIR at the time they submit their offer relieves the seller and their agent from liability for property defects not observed during the seller’s agent’s visual inspection, or which ought to have been known to the seller or the seller’s agent, known as red flag defects. However, when the seller’s agent relies on the HIR to avoid liability for faulty preparation of the TDS, the seller’s agent needs to make a competent (read: non-negligent) selection of the home inspector they request to inspect and prepare the HIR. Thus, the seller’s agent needs to exercise ordinary care when choosing a home inspector. On receipt of the HIR, the seller may voluntarily eliminate some or all of the deficiencies noted in the report. However, sellers are not obligated to eliminate any defects they disclose in the TDS and HIR when selling a property, unless they negotiate with the buyer to do so. On the voluntary elimination of any defects noted in the HIR, the seller’s agent orders an updated report for use with the TDS to deliver updated mandatory property disclosures to buyers intending to make an offer. Editor’s note — Although Home Energy Raters are specially trained and certified, any home inspector may perform a home energy audit provided the audit conforms to the California Home Energy Rating System (HERS) regulations established by the California Energy Commission. Editor’s note — When representing a buyer and the home inspector who prepared the HIR is unknown to the buyer’s agent, it is good practice to recommend as part of the buyer’s due diligence investigation that the buyer also conduct their own inspections pertaining to all physical aspects of the property. The existence of a hazard due to the geographic location of a property affects its desirability, and thus its value to prospective buyers — a material fact requiring disclosure before contracting to sell. Hazards, by their nature, limit a buyer’s ability to develop the property, obtain insurance or receive disaster relief. Whether a seller lists the property with a broker or markets the property themselves, the seller is to disclose to prospective buyers any natural hazards known to the seller, including those readily available in public records. All sellers of real estate, and any seller’s or buyer’s agents involved, have a general duty owed to prospective buyers to disclose conditions on or about a property which are known to them and might adversely affect the buyer’s willingness to buy or influence the price and terms of payment the buyer on knowing the facts is willing to offer. Natural hazards, or the lack thereof, irrefutably affect a property’s desirability, and thus value to a prospective buyer. To obtain the natural hazard information, the seller and the seller’s agent are required to exercise ordinary care in gathering the information. They may gather the information themselves or the seller may employ an NHD expert, such as a geologist, to gather the information. The Natural Hazard Disclosure scheme encourages brokers and their agents to use natural hazard experts to gather and report the information publicly available from the local planning department rather than do the work themselves. The use of an expert to gather information from the public record and prepare the report relieves the seller’s agent of any liability for errors not known to the agent to exist. Form updated 06-2017 to include the Form Description at the top, white header/footer convention and RPI branding. Form navigation page published 09-2017.